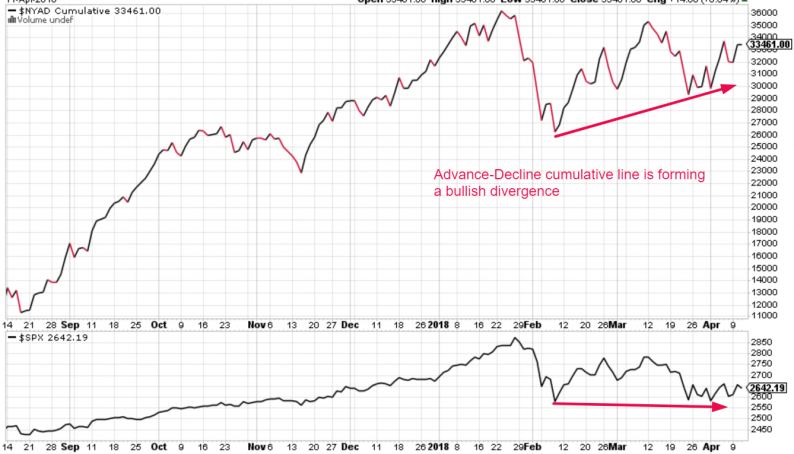 We mentioned before that the stock market is forming a bullish breadth divergence. You can clearly see this with the Advance-Decline cumulative line, which is making “lower highs” even though the S&P 500 is close to retesting its February 9, 2018 lows. Hayes Martin from MarketExtremes.com found 8 similar cases since 1950 in which the S&P 500 formed a bullish divergence such as this in momentum and breadth indicators. Here are those historical cases, and here’s what happened next to the U.S. stock market. This bullish divergence happened at the exact bottom of the S&P 500’s 15.2% “significant correction”. The U.S. stock market soared throughout the rest of 2016 and 2017. This bullish divergence happened 1 day after the S&P 500 ended its 9.8% “small correction”. The S&P’s next “significant correction” started 7 months later. This bullish divergence occurred one day before the S&P completed its 21.5% “significant correction”. Then it promptly started to rally upwards in a very volatile manner. This occurred a few days after the 2007-2009 bear market ended. The S&P 500 soared throughout the rest of 2009. This historical case does not apply to today because we are not at the bottom of a bear market or recession. This bullish divergence happened at the exact bottom of the S&P 500’s 20.3% “significant correction”. The S&P soared throughout the rest of 1990-1991. This bullish divergence happened during the retest wave for the October 1987 crash. This marked the exact bottom of the retest wave. The S&P 500 rallied from 1987-1990.